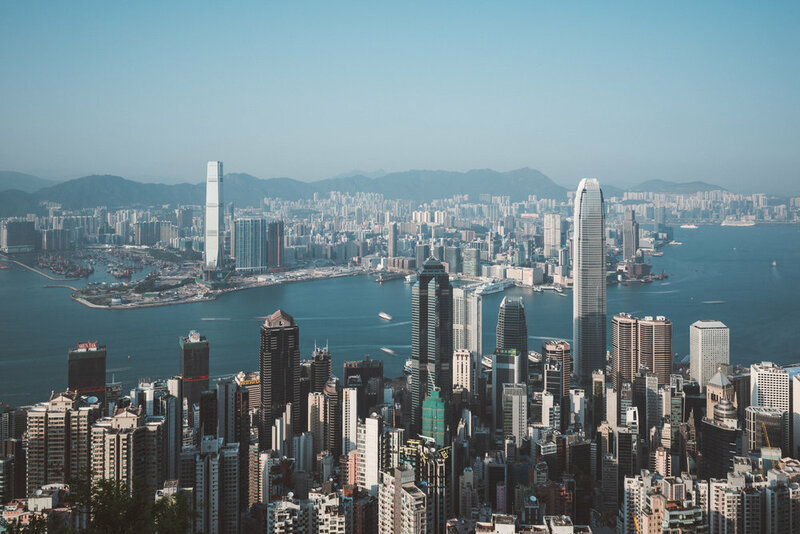 Hong Kong means "fragrant harbour" and is the fourth-most densely populated region in the world, with over 7.4 million Hongkongers of various nationalities. This was my third visit to the Pearl of the Orient. You have to experience the power of the city to understand why it's attraction is so massive to me. It's like falling in love over and over again. The only difference is: she won't get tired of you. The diversity in scenery and landscape is enormous. 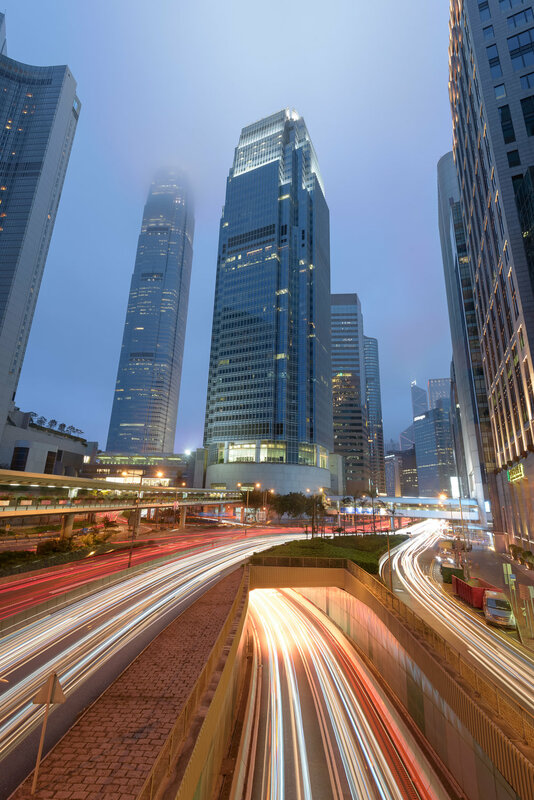 Hong Kong changes every 5 minutes. You can be in a park on the Island, wander in the middle of a concrete jungle surrounded by millions of people or take a massive hike in the mountains. When I say massive, believe me, that's still underrated. And this all within a span of 30 minutes. I arrived in the afternoon after an 18-hour 2 stops flight with Emirates. I've been flying with them for years now and I have to say they're my favourite for many reasons. After I dropped my bag at the hostel I headed to the first location on my list. The Connaught Road Central bridge, a bridge that runs over one of the busiest streets in Central. With traffic divided over 8 lanes, it's a sight for sore eyes. I was just in time to witness blue hour and shoot the multiple exposures I needed to blend my images the way I wanted them to be. After falling asleep around 4 a.m. (insomnia FTW) I woke up at 7 a.m. and started to pack my bag and got ready to meet up with my buddy Anthony. Anthony is a true Welshman who moved to Hong Kong a few years ago and fell in love and got married to Xue. We met in 2016 when I headed up to The Peak to take some sunset shot. We started talking and noticed we liked the same kind of photography. So we kept in contact these last 2 years and he invited me to stay a few days at his place which I was very grateful for! It gave me the opportunity to see a different side of Hong Kong. He lives at Sai Kung - 40 minutes from Victoria Harbour. After settling down we took a 15 minutes boat ride to Sharp Island. A place where people go to have a BBQ and some (bad) karaoke. We started out strolling around the Tseung Kwan O area. Tseung Kwan O is still a part of the Sai Kung District in the southeastern New Territories. It's built partially on reclaimed land. It's known for the high density buildings. Afterwards we payed a visit to the Nan Lian Garden - a Chinese Classical Garden in the middle of a concrete jungle. In the late afternoon we headed to the newly built Ocean Terminal Deck which to my surprise wasn't crowded at all. So we had a few hours to kill the time and set up our gear the way we wanted. To be honest, the sunset was a bit dissapointing. But the car park we snuck in to have a night shot of the Temple Street Night Market made the dissapointment go away. It's all about preparations and locations. After saying goodbye to Anthony I headed back to the Island and dropped my belongings at the hostel. This would be a more "relaxing" day and just enjoy the weather and the spring breeze, which would be a summer breeze back in Belgium I guess. 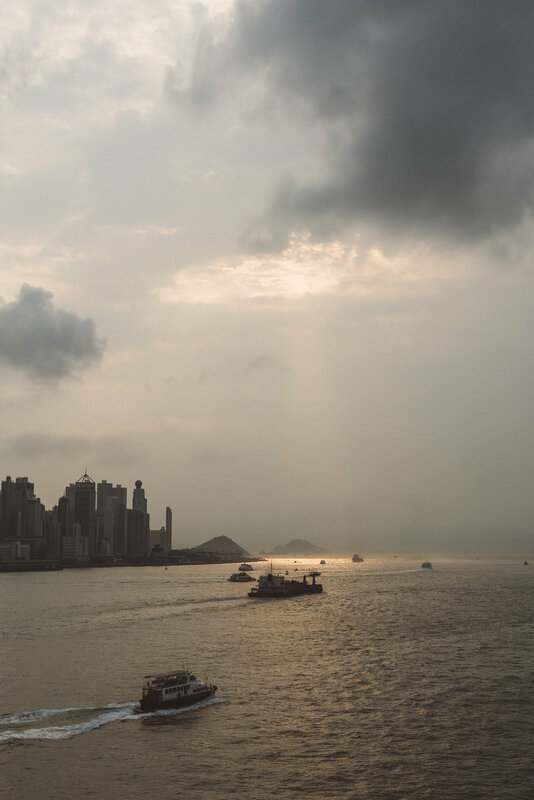 Hong Kong summer weather is extremely hot and humid, with frequent thunderstorms and occasional typhoons. I had the pleasure of experiencing tropical cyclone Rammasun back in 2014. I witnessed signal number 3, which I thought was impressive, but to locals peanuts so they've told me. Apparently it was International Day of Happiness, so who was I to complain while I was sitting on the steps of the Ocean Terminal Deck and enjoying a nice blue hour shot? A little Zen moment for once. Thumbs up! Probably my most favourite and memorable day of the trip. 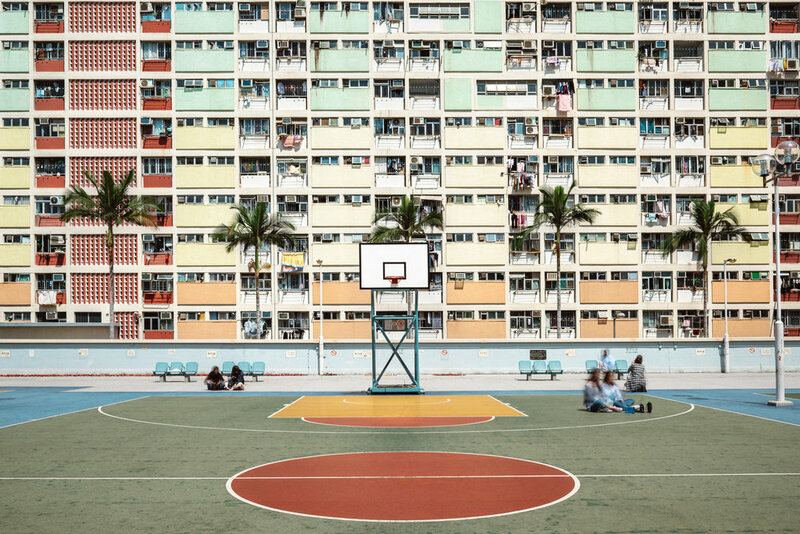 Visiting one of the most amazing places in Hong Kong will always be the Choi Hung Estate to me, also known as the "Rainbow Estate". I think you get the picture why it's called that way? 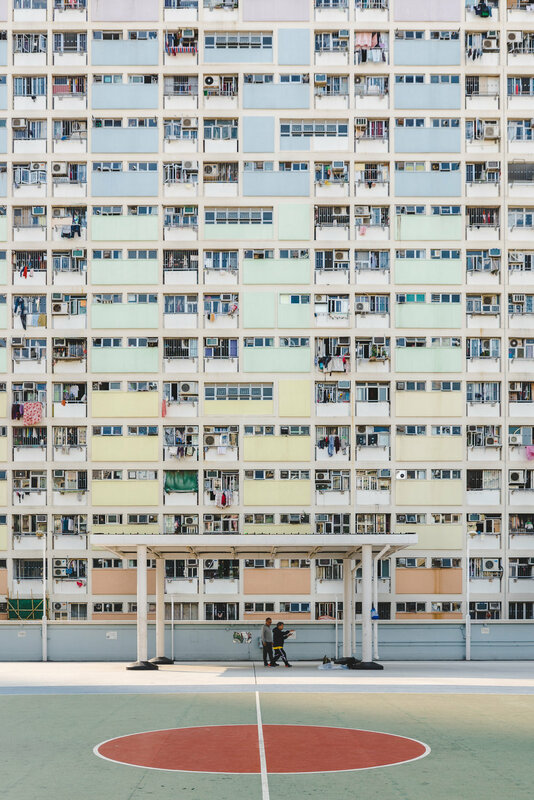 The palette of colours reveal the identity of one of the oldest public housing estates in Hong Kong. It's a place where I feel i'm creatively at my best. It has so much potential and I have a whirlwind of ideas in my head. It's a unique place for sure. Nearby you have the Ping Shek Estate or as I like to call it: the "no pictules, no pictules" Estate. They get a lot of photographers in their private space, not all of them respect the rules like they should. So I imagine not all the residents like us over there. But I was well prepared and got my shot in under 3 minutes. Being semi-autistic makes you plan stuff out before. Sunset time took place near Kennedy Town. The (in)famous "Instagram Pier" was a cool spot. But I headed a bit further through the hilly section to the Sai Wan Swimming Shed. As I arrived my first thought was: "what a cool place for a pre-wedding shoot?!" We'll what do you know? After 10 minutes the first couple arrived. My senses were right (once again). I was lucky to have them standing still for 30 seconds so I could take a long exposure which turned out pretty cool. Maybe my future lies in Asian pre-wedding photography, haha. Buildings, buildings, buildings... You get the point. The one thing Hong Kong has plenty off: buildings! That's why I prefer to call it a concrete jungle. I sure do like the look of it all. I got back to my favourite Choi Hung Estate to take some pictures in the early morning with the elderly practicing yoga. There weren't many thouhg, little fail. Still had a fun time talking to other photographers. Next on the planning was the Nam Shan Estate. One that was on my list for a while now but I never found the time to make it out there. Apparently it's ancient and "so 2008" to take pictures there, but I think it's was worth the trip. After another busy day, I prepared myself for my Braemar Hill hike at sunset. It was near my hotel for once. With near I mean, taking a shuttle bus for 20 min and hike up a trail for 45 minutes. That was a brutal hike, especially 'cause I had to memorize the route I took and redo it in reverse in the dark. I had a little head light but that was it. After the hike up Braemar Hill I realized I was on the wrong location. But I was still happy with it since I was the only photographer at that spot. Which gave me room and time to set up my camera. I met a little girl who was hiking with her father. Her name was Mia and she wanted to talk English to me. It was funny and adorable at the same time. I ended up talking for an hour with her father about the history of China and Hong Kong which was pretty learnfull to me. It's always nice when you travel by yourself and meet new people, what happened quite alot this trip. After my blue hour shot of Victoria Harbour it was time to "sprint" back down which was pretty scary for me. A pitch black trail and trees hanging all over the place. Knowing there were monkeys, snakes and spiders didn't make the time go much faster. Trust me, when it's dark everything sounds like you go into the House on the Haunted Hill. I was happy to be back down and out of the real "jungle". But it gave me some nice and creative shots, so it was worth it for sure. This trip I haven't spent that much time on the Island like I used to do. I was all over the place which was quite refreshing for once. So much more to discover in "my hometown". The more reasons to go back and keep exploring. The first image shows you Admiralty with on the right the Military Base for the Chinese People's Liberation Army. I was standing near the Central Government Offices where Joshua Wong was arrested in 2014 by the police during a massive pro-democracy protest, after hundreds of students occupied Civic Square in front of the Central Government Complex as a sign of protest against Beijing's decision on the 2014 Hong Kong electoral reform. He was 17 at that time. More than 100,000 people took to the streets at the height of the Occupy Central protests. At the age of 14 he started "scholarism", a group that protested against the newly-announced Moral and National Education. Which meant China tried to push the kids in learning to be more patriotic a.k.a. learn what the government wants. But enough history for now, it sure is an interesting fact if you care. Or when you're a concerning parent. Sunset took place at Lugard Road, my "secret" spot. This one's less crowded than the regular Peak spot. But you need to be in time to get the spot you want. Sunsets have been dissapointing through the whole trip but the view never gets old for sure. Time to leave. This was my third time to Hong Kong. Every time it gets harder to leave. Somehow I always find the best version of me over here. This always makes me think and dream of a life on the other side of the world. I had the whole day to ease into the thought of leaving. My flight left at midnight. I did some shots in the Tsim Sha Tsui area of Kowloon where I found a lovely bride who was gazing over Victoria Harbour while she was waiting for her pictures to be taken. For some reason my settings were off and I had to shoot through glass. But I liked the outcome of the picture. I'm glad I had the wrong settings on this one. A place I always wanted to visit but never got to was the Yick Fat Building in Quarry Bay. It got famous since it appeared in the Transformers 4 movie. You have this iconic view when you're in the middle between the buildings and look up. Sadly the same "no pictules, no pictules" policy. So time was of the essence. Luckily it went without hitch. The remainder of my day I spent in the warm spring breeze at the Ocean Terminal Deck hoping for an epic sunset. But it's just not the season for those nice vivid colours. Too bad, but I can't complain with the shots I got. It's a learning process with a steep learning curve. And that satisfies me and keeps me motivated. One thing I learned (again) this trip. You can be as prepared as you want. You still get surprises thrown at you. And trust me, I'm well prepared. After the sun had set it was time to get my backpack and start on my journey to the airport and wait for my flight to leave. This was an amazing trip where I met lots of new people which I hope to meet again someday. You'll always be in my heart Hong Kong. See you next time!